One of the best tips that I ever received about playing the violin involved my right hand. I'd often heard the idea that you should not grip the bow strongly. I had heard my teacher talk about a "soft" right hand. I had watched my teacher's bowing lesson after lesson. But something just wasn't right. I've told you about my "death grip" problem, that at first I held the bow so tightly that I would get cramps in my right hand. I fixed that, but I still wasn't getting the flexibility that I needed to bow effectively. Then somebody told me that what I needed to do was think of my right shoulder, right arm, right wrist, right hand and the fingers of my right hand as one big set of springs. That just made sense to me. There wasn't anything stiff in a set of springs. The idea wasn't to press the bow, shove the bow or anything else so dramatic. The bow was to be moved in a relaxed, fluid motion. Try it! Put down your bow and shake your arm gently until it is relaxed. Then use springy fingers to pick up the bow. Keeping that fluid, relaxed feel throughout the hand, wrist, arm and shoulder try playing long, slow strokes with the bow. Nice, legato bowstrokes. Pay attention to how it feels in your hand and arm, and try to maintain that feeling when you play. 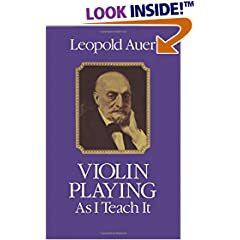 A Very Good Book on Violin Technique for the Intermediate to Advanced Player. Written by the man who taught Mischa Elman, Efrem Zimbalist, and Jascha Heifetz.